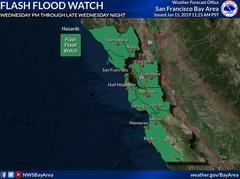 The San Leandro Police Department’s Emergency Services Division, in conjunction with the AC Alert system are issuing an important message regarding a flash flood watch and high wind advisory for all of Alameda County beginning Wednesday and extending through Thursday. A high wind warning, with gusts up to 50mph is also being issued for the East Bay Hills. The National Weather Service forecasts rainfall totals up to 1.5 inches with potential thunderstorms. 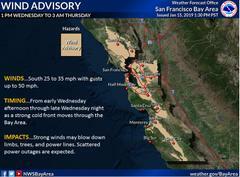 This storm will likely increase ground saturation, and combined with high winds Wednesday night through Thursday morning, will increase the potential for downed trees, mudslides, power outages, and flooding of city streets. Please follow storm updates by staying tuned to local media outlets.